IT departments can do lots of things. They can operate IT infrastructures with limited budgets and can manage the integration of systems built on completely different platforms. They are also resourceful and are skilled at dealing with individuals of all levels of IT ability. 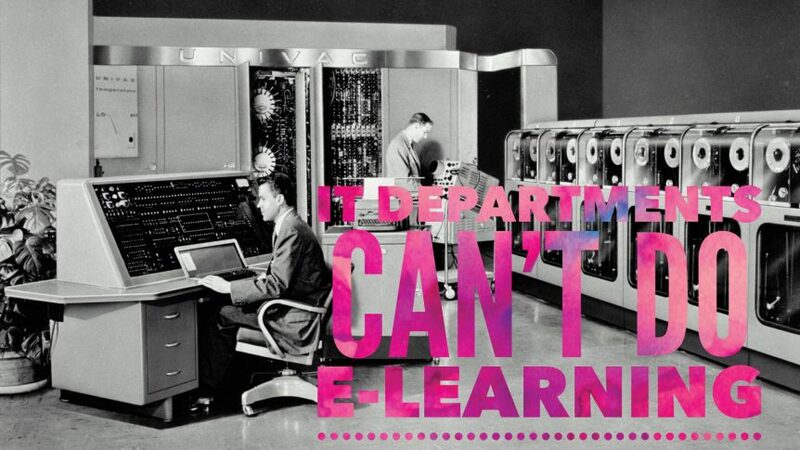 One thing they can’t do, however, is e-learning. Is that a controversial thing to say? It isn’t when you speak to IT professionals. They know understanding technology and being comfortable using it doesn’t mean you can do everything in the IT sphere. It is just like riding a horse: there is no way I could handle a champion racehorse in a field of 20 on a gallop around Meydan. Like many others, I can ride a horse, but I can’t ride a horse like a professional jockey rides a racehorse. Developing an e-learning course involves using technology to create the materials, and it requires a general understanding of technology to ensure the course is delivered on the right platforms in the right format. Making the course interactive, interesting, and engaging, however, requires a unique skillset. In other words, you need more than an understanding of how to use PowerPoint, and you need more resources than a library of clipart images. Creating an e-learning course is about achieving learning objectives. This could be upskilling your team, refreshing their knowledge, introducing new guidelines or practices, or any other objective that is important to your business. To achieve learning objectives, e-learning courses have to be effective. After all, your business will gain nothing from the course if learners go through the motions but fail to take in the information because the course was boring, uninteresting, confusing, or not relevant. This is the real job of an e-learning professional – ensuring the course is the opposite of boring, uninteresting, confusing, and irrelevant. That means creating fun, well-structured, interesting, and audience focused e-learning courses. Technology is simply the creation and delivery tool. Technical acumen – while technical ability is not the only skill you need, it is a core requirement. In fact, training and/or education professionals who lack IT skills often find it hard to transition into the e-learning sector. Training experience – understanding how people learn is also important. You have to know how to progress individuals who learn at different speeds, firmly establish concepts before moving onto the next, and much more. Design abilities – learners interact with high-quality apps, websites, and other forms of media daily (hourly in some situations), so their expectations for design are very high. In e-learning courses, they expect a design that makes the course intuitive to use and engaging. They also want variety and designs that are attractive. IT departments certainly have the first skill, but rarely do they have either of the other two, let alone both. A lot of organisations that get their IT departments to put together e-learning courses and modules do so for cost reasons. After all, as they already have an IT department in place, the only potential cost is an e-learning platform. This is the wrong way to approach the issue, however. Tasking IT teams with delivering an e-learning project may be cost-effective but we have already established that it is not effective. The reality is it is often better to spend nothing at all rather than spend a little on something that won’t do justice to your brand and/or will not deliver on your learning objectives. In other words, the real question should be about return on investment, not cost. When you look at e-learning from an ROI perspective, the only way to do it properly is to outsource the development to e-learning professionals. If you produce a lot of e-learning materials it might be an option to recruit someone directly onto your team with the list of skills mentioned above, but that is not suitable for the vast majority of organisations as they don’t produce enough content to require a directly employed expert. That brings us back to using third-party e-learning professionals. What you can expect when you go down this route is someone who will use training knowledge, experience, and research alongside design skills and technical abilities to ensure your business gets the maximum possible benefit from the project.